ReactCasino Cash Back Bonus: 100% up to 1500 EUR + 10% LIFE TIME Cashback! Shields up! 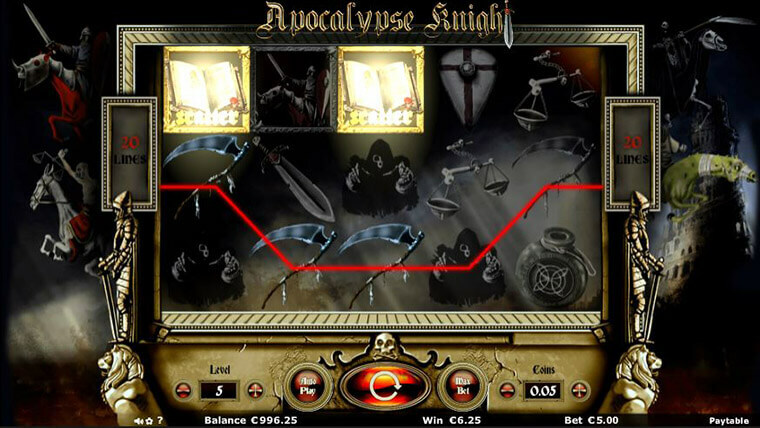 Join the final battle from the end of days with this online video slot from Join Games. Apocalypse Knights is available both on desktop and on mobile devices and can be played from as little as 1p. Spin the 5 reels and 3 rows for a chance to land on any of the 20 paylines and grab prizes of up to 750 coins. With an RTP of 95.49%, medium variance and gameplay features like Falling Wilds and Free Spins, it is sure to be a fun and rewarding experience. Wild – can appear on any reel and substitute for all symbols except for the Scatter. Falling Wild – appears randomly only on reel 2 and it can substitute for all others except for the Scatter. Free Spins – are triggered when landing 3 Scatters anywhere on the reels. All wins are tripled during all the extra spins.